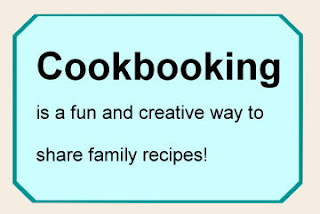 Cookbooking: Is It a Scrapbook?~Is It a Cookbook?~It's Both! Have you heard of cookbooking? I hadn't either until I found this book. Although I have made family cookbooks as gifts, it somehow never occurred to me to decorate them like a scrapbook. In fact, one of the most appreciated gifts I have given new brides and new graduates heading off for college is a homemade cookbook of family favorite recipes. This was brought home to me again when I recently visited my brother's family. His wife still has the cookbook I made for her when they married over 20 years ago. I made cookbooks for several of my sisters-in-law, my sister, my daughter, and my daughter-in-law. Several times through the years, I have been told that these gifts were much appreciated. Looking for some scrapbooking cookbook ideas? These days, a family cookbook can be more elaborate than just typing up recipes to pop into a three ring binder. Mind you, I still prefer the three ring binder to using a photo album or a scrapbook for several reasons. First, the binders are easily covered with your choice of fabric and lace. They can even have special touches such as embroidery. If you are worried about the cover being soiled, cover it with a lightweight layer of clear vinyl. Using fabric or vinyl to cover the binder means you can recycle used binders, too. Second, you can purchase page protectors and plastic photo protectors designed for three ring binders. Printer paper, 11"x8.5" is easy to come by in a wide variety of colors and weights. For pages I intend to embellish, I like to use either 65 lb. card stock or 110 lb. card stock. Unfortunately, my printer balks at the 110 lb. paper, so if I plan to print on the card stock, I have to go with 65 lb. or 90 lb. paper. For anyone who loves creating crafty gifts, or for anyone who desires to create a memorable gift for someone you love, Cookbooking: The Delicious New Way to Scrapbook is a helpful guide. With step-by-step instructions, you will be on your way to creating a gift that will be talked about and appreciated for many years. 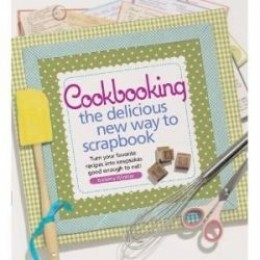 A while back, I saw Cookbooking: The Delicious New Way to Scrapbook at my favorite bookstore and just had to have it. This delightful book has recipes, tons of images and photos to help get the creative juices flowing, and step-by-step how-to's to make creating your own cookbooking project easy. The author suggests using a 12"x12" scrapbook, and I suppose some people would prefer it. However, for reasons mentioned previously, I prefer the three ring binder. With included instructions for embellishing recipe boxes and creating recipe themed greeting cards, this book has given me lots of ideas for my gift giving list. And I plan to make my own Christmas cards this year, and share some of my favorite holiday recipes in them! One of the most important ideas in the book is how to create a divider page with pockets, so that recipe cards or clipped recipes can be easily stored. Cookbooking is a fun and creative way of scrapbooking to create a treasured gift for someone you love. And a great way to use up bits and pieces of craft supplies such as ribbon and lace, too. Or buy a copy of this amazing book to give a crafty person for a birthday or Christmas gift! What a great idea! My mom made a photobook for me with pictures and recipes but there is no way to protect the pages so I won't let it anywhere near the kitchen. Love this! The first few cookbooks I made for myself and as gifts did not have protected pages either. After my cookbooks were food stained, I decided to use the page protectors mentioned in the article when I created new cookbooks. Thank you for commenting!